These model stand out as highly professional tools with their 7 mm thick tank walls. A 340 cm³ pump generates a working pressure of 3 bar in the 5 L tank after astonishingly few strokes. The sprayers are extremely robust, easy to use and cleaning is as straightforward as can be. These sprayers are best-in-class appliances and the large filling and cleaning aperture only adds to their appeal. 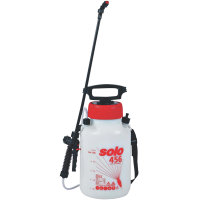 The current spray medium level can be Manual pressure sprayers with shoulder strap checked easily and directly on the tank. These models possess some remarkable quality features such as a practically unbreakable spray wand over 50 cm long, robust handles with an optional pressure gauge and a selection of spray nozzles. What's more, these are all included in the standard delivery. UV-resistant plastics promise robustness and a long service life for these sprayers. The thick wall makes the tank almost indestructible.